Did you know Alex Proyas has a new film coming out this year? I think I did, but I forgot, and now I wish I could go back to forgetting because these posters for the fantasy film titled Gods of Egypt are very disheartening. The director of some of my favorite films including Dark City, The Crow and Knowing (yes, I liked Knowing a ton) is either being punked by the Lionsgate marketing department, or the movie will be a multi-coloured disaster. Set (Gerard Butler), the merciless god of darkness, has usurped Egyptâ€™s throne, plunging the once peaceful and prosperous empire into chaos and conflict. With only a handful of heroic rebels opposing Setâ€™s savage rule, Bek (Brenton Thwaites), a bold and defiant mortal, enlists the aid of powerful god Horus (Nikolaj Coster-Waldau) in an unlikely alliance against the evil overlord. As their breathtaking battle against Set and his henchmen take them into the afterlife and across the heavens, both god and mortal must pass tests of courage and sacrifice if they hope to prevail in the spectacular final confrontation. Gerard Butler (Olympus Has Fallen), Nikolaj Coster-Waldau (Game of Thrones), Brenton Thwaites and Abbey Lee stars among others. They all look bored but mildly annoyed to see the photographer. Not very inspiring. I don't mind the color, though. A break from the trend towards dark-and-desaturated would be nice. These posters look fabulousssss!! Almost as fabulous as a Greek bathhouse, after hours. Lol. 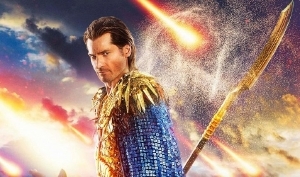 The one with Gerard Butler looks like a Bollywood version of 300. Isn't this somewhat reminiscent of Emmerich's 10,000 BC?